PFB-276. 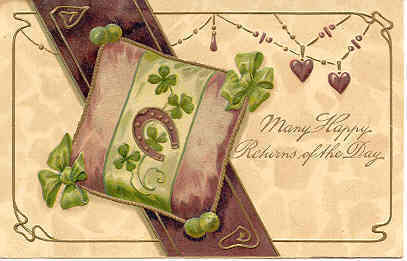 A beautiful Birthday Greeting Post Card with Shamrocks and a Horseshoe for Good Luck. Published by Paul Finkenrath, of Berlin it is series 8038, card 6, and listed in the McAllister PFB Guide. It is highly embossed with rich deep colors has a DB-UNU with writing on the back and in Excellent condition. Buyer pays 1.95 S H for U.S. delivery 1st Class Mail. FOREIGN and all other addresses will pay 3.95 S H for Standard International Flat Rate Delivery. Discounted S H available for multiple card purchases. Insurance is the responsibility of the Buyer as all cards are very well packaged and I will not be responsible for loss or damage once the card has been shipped. I accept Cashiers Check, Money Order, or Personal Check. NO CREDIT CARD PAYMENTS OF ANT SORT.